Willy Franzen and I met not too long ago at a “hacker meetup” in Chicago, and I immediately fell in love with his startup and the story of how it all started. 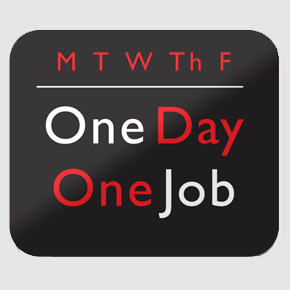 The name of the website is called OneDayOneJob.com, which as the name suggests features one employer every day, of whom is looking to hire an entry level position for college graduates. Willy also runs OneDayOneInternship.com which is the same concept except for internships. He started the company straight out of college. He snuck into a job fair, spoke to every recruiter and got 40 business cards of recruiters who said they were interested in being featured. Only 1 out of those 40 responded after he followed up. He then took another approach which eventually got their attention. He is not a web developer or programmer. Both sites run purely off WordPress. He talks about how he picked up the skills to get the site running. He is completely bootstrapped, with no outside investment. He has received significant offers to be acquired, but he has turned them all down. The site has been featured on Times, Readers Digest, Business Week, Freakonomics Blog, Science Magazine, Slate & Big Money Magazine. Since the interview is kind of long, we provided a linkable table of contents so you can go to the question that you want to see answered. Where did you get the motivation for this idea? How long did it take you to go from idea to implementation of the site? How did you market the site in the first 6 months, what were your biggest challenges? Why did you decide to stay bootstrapped? Have investors approached you to invest in the site? How do you make money? Take us through the different revenue models you tried. What were the challenges with each? What advice can you to other non technical entrepreneurs like yourself. 1. Where did you get the motivation for this idea? I graduated from Cornell in 2006 and headed for a career in Human Resources. After two summers of interning in HR, I knew that I was about to make a bad choice. I decided to turn down a few job offers and look at my other options. I took some time off over the summer, and when I started job searching, I became very frustrated. Part of it was that I knew that I wanted to be an entrepreneur, but didn’t know what to do or how to do. A bigger part was that I didn’t have a clear idea of what I wanted to do, and I couldn’t find a good way to learn about what’s out there for new grads. Job searching is easy if you want to go into banking or consulting, but it gets a lot harder when you’re not sure what you’re looking for. I started thinking really hard about how I could provide a service that would introduce students and grads to options that they’d never considered before. 2. How long did it take you to go from idea to implementation of the site? Before I even started One Day, One Job, I started getting involved in the online recruiting community. I wanted to learn everything that I could about how employers reach candidates on the Internet. I read the blogs, I participated in some early social media sites, and I reached out to big names in the industry. This included applying for a job at a big startup in the space. I sent a cold e-mail to the CEO and told him about some of the ideas that I had for changing how online recruitment works. It got me an interview for a Business Development position, and it went well until the CEO walked in. I was trying to explain what I had been doing since I graduated (admittedly not much) and I started talking about One Day, One Job (it was no more than a few weeks old at this point). He got pretty angry at me for coming in to interview when I was working on what could be a competing product. 3 years later, his company became One Day, One Job’s biggest revenue source (through an advertising platform). In late May of 2007, I came up with the idea for a site that features one job every day (like Woot for jobs). At first I thought that I’d need to hire someone to build the site, but I decided to just give it a go. A friend mentioned WordPress as a CMS platform, so I started playing around with that. My mom is a Graphic Designer, so she did my logo, and I built the site based off of the design of the logo. I had done some basic web development in high school and early college, so I taught myself how to build a WordPress theme and kludged together a working site based on a custom theme over the next 6 months (One Day, One Job launched in November of 2007). I found that FeedBurner could deliver daily e-mails for me, so I had everything that I needed for free. All I had to do was pay for a cheap shared hosting plan. (Over time I’ve had to upgrade my hosting to a cloud VPS, build on top of a more sophisticated paid WordPress framework, and move my e-mail list to AWeber. But the free/cheap stuff took me a really long way.) The technology was the easy part. Getting the product right was much harder. That’s why I spent a ton of time researching and learning. I was constantly looking at competitors and trying to figure out what it would take to build something that could gain traction quickly. I probably could have been much more structured in the way that I approached the problem, but I chose to get a feel for the market. I did a lot of watching and thinking while keeping mostly quiet about what I was working on. The original idea was to sell a sponsorship every day. It was a good idea, but it was too hard for me to implement. I had no traffic, so I couldn’t even give away free trial postings. I didn’t have any jobs, so I couldn’t build an audience. Other people have succeeded with this model (Groupon), but they’re usually selling to a Marketing/Advertising/Sales department. I was selling to HR. They’re far more resistant to change, so a new idea wasn’t something that they were willing to invest time in learning about. I even snuck into Cornell’s career fair to pitch employers (I was all sketchy about it, yet they’re more than happy to have alums go to the fairs). It was the first time that I really put my idea out in the public. I targeted employers whose booths were empty. I introduced myself, told them a little bit about One Day, One Job, and offered them the opportunity to get a free posting. A lot of people were excited about what I was doing, so I was excited when I left with 30-40 business cards in my pocket. I followed up with every company that I spoke with, but I got almost no response. Even a free trial wasn’t worth their time. I waited and waited for the employers to get back to me, but it never happened. (3 years later one of the relationships that was formed at the career fair turned into a sponsorship.) So I made a drastic change to my plan. Instead of working with employers to put together the features and charging them for the placement, I decided to make my content editorial. I’d write profiles on companies and their entry level jobs with nothing more than the publicly available information that every job seeker has access to. That way I’d have the content to build an audience, and eventually I’d be able to sell the ability to get in front of that audience. It worked. 3. How did you market the site in the first 6 months, what were your biggest challenges? After I launched, I focused almost singularly on growing the audience. One of the first things that I did was put together a cornerstone article that could generate some buzz. It was called How to Use Google to Find a Job –http://www.onedayonejob.com/blog/how-to-use-google-to-find-a-job/ I used that article to introduce the site to people. It did really well on StumbleUpon, and it generated a lot of incoming links. It also helped me grow my exposure in the job search community. I spent a lot of time personally e-mailing as many Career Services offices as I could find e-mail addresses for. I introduced myself and told them about what I was doing with One Day, One Job. This helped me build more incoming links, and I was able to find a few people who really loved the site and shared it with lots of students. This was really time consuming, but well worth it. Facebook launched their PPC platform right around when One Day, One Job launched. I used that a lot too. I targeted students at Ivy League and Top 40 schools. I figured that it would cost the same to reach them as it would cost to reach other students, but they’d be much more valuable when pitching to employers. It helped me build a small following at a lot of elite schools, and to this date One Day, One Job continues to have a strong presence at the schools that I targeted. I don’t know if that’s a coincidence, but it really helps me sell advertising. Finally, SEO was a big focus for me. It didn’t pay many dividends in the first 6 months, but by understanding the core ideas behind SEO, I was able to build a foundation for a site that would rank well moving forward. I didn’t realize how big search would be in driving traffic to the site. I also tried giving away a Nintendo Wii. I ran a contest for users who helped spread the word about the site. It failed miserably. I eventually learned that virality and job search don’t fit together. People don’t like sharing stuff related to their job search. It’s a personal matter that most people don’t like putting out in public. I’m glad that I learned this early, because it’s easy to get caught up in chasing viral growth. In some markets it’s just unrealistic. 4. Why did you decide to stay bootstrapped? Have investors approached you to invest in the site? When I started, I didn’t really know anything about startups. The thought of using other people’s money to grow my business was completely foreign. My parents and girlfriend helped to support me along the way, but I figured that if I couldn’t get to profitability with what I had, then I’d have to go get a job. One Day, One Job’s expenses are minimal, so I was able to last a really long time on my savings. In a lot of ways I straddle the line between startup and lifestyle business, but I certainly consider One Day, One Job a startup. I’ve had a few investors approach me along with a few acquisition offers. I talk to everyone, but I’ve told the investors that I’m not interested. I’m always interested in a potential acquisition, but it has to be the right fit. There are a lot of ways that I could put capital to use for One Day, One Job, but I think that investment would change the conversation. I’m ok with the fact that One Day, One Job is never going to be a $100 million business, but I think that it can be a $5 million business. I’d be thrilled with that. Investors wouldn’t. By owning 100% I have a lot more flexibility, and I might even stand to make more if I ever do exit. I definitely stand to gain more if I decide to keep doing One Day, One Job for a while. 5. How do you make money? Take us through the different revenue models you tried. What were the challenges with each? Like I mentioned before, the original idea was to sell placement in our daily profiles. It didn’t work. Selling to HR is a full-time job, and you can’t do it if you don’t have something to sell. Luckily, my choice to move to editorial content enabled me to build a really significant audience.Between One Day, One Job and One Day, One Internship we have nearly 14,000 subscribers, and the two sites combine for 100k-150k unique visits per month (it’s quite seasonal). From launch, I’ve pretty much stayed focused on an ad-supported model with one big bump in the road. The initial plan was to sell sponsorships alongside the editorial content. It took me a year to get my first sponsor. It was $500. Suddenly I was getting a lot of interest from employers. Then the economy tanked and everyone who had contacted me said “Let’s wait and see what happens over the next few months.” My next sponsor came almost 15 months later. Advertising jobs beyond job postings is unfamiliar territory for a lot of people in recruiting, so I try to focus on working with employers who already get it. I think that I should probably sell harder, but it’s hard to get the conversation moving in the right direction. I think this could be the area where I gain the most in 2011. The contextual job advertisements section represents a huge win and a surprise. I had worked with the ad network before, but it never did much for me. Out of desperation I tried implementing it again late last year. Once again, it made me a few dollars over a few days. However, my business development contact at the company contacted me when he saw all of the impression that I had delivered. He helped me change up my approach, and it became a revenue source that I was able to grow significantly over the 4th quarter of 2010. This is great, because it’s essentially automatic. But there’s always room for improvement. I’m putting an increased emphasis on affiliate marketing in 2011. A lot of people think that all affiliate marketing is sketchy, but I’ve found a few partners that live up to my standards. The offers add value for the One Day, One Job and One Day, One Internship audiences, and they perform well. It’s still something that I’m learning a lot about, but I’m excited at the potential. (I also occasionally promote my referral links for Bonobos and Gilt Groupe. I never intend to spend money on clothing again because of this. 6. Are you profitable now? Yes, 2009 was technically profitable. 2010 was enough to pay my rent. 2011 is looking much better. In 2 months, I’ve already covered business expense for the year (they increased significantly because of some necessary upgrades, but they’re still very low). I’m hoping to invest in some interns (who should always be paid) soon. 7. What advice can you to other non technical entrepreneurs like yourself? Don’t underestimate the power of content businesses. There is huge potential. Monetization, marketing, and business development are areas where you can add immense value without technical skills, but you need to commit a ton of time to learning them. They’re not easy just because they’re not technical. I’ve seen a lot of businesses fail in my space. The non-technical founders have typically failed because they couldn’t control technology expenses and didn’t understand the technology that is core to their product (even if it’s not all that high-tech). There have also been a lot of technical founders that have failed because they didn’t understand the market. They thought that flashy technology could solve the problems that plague HR and job seekers. It’s just not that easy. It’s really hard to be a completely non-technical entrepreneur if you want to build an Internet business. Without my barely adequate coding skills, I probably wouldn’t have made it to profitability. It would have been too expensive to build and maintain the site. By piecing together free technology, I was able to build a pretty decent platform for reaching job seekers and helping employers get their message out. I had some prior knowledge, but I learned most of it along the way. If you do everything yourself, you can last a lot longer. 6 months ago my business was nearly identical to what it is now, except now it’s making money on a consistent basis (still not nearly as much as I’d like). If you can buy yourself enough time to try a variety of things, you can often stumble upon something that will make a huge difference. I can’t tell you why I never quit, and I can’t tell you what gave me the confidence to keep going, but I’m glad that I did. If you’re constantly learning and working towards something, advantages accumulate. Eventually you figure out how to combine these advantages and start making money. Just make sure that you’re building all of the advantages along the way. Check them out at http://www.onedayonejob.com, http://www.onedayoneinternship.com or follow Willy on twitter @willyf. The Story of Cruise (YC W14): How 4 people built a self driving car in 7 months. Brian Sheridan on Startup Toolbox, a resource for startups. Aleksandar Olic on Startup Toolbox, a resource for startups. AcTouch Technologies on Startup Toolbox, a resource for startups. Bisade Karunwi on Could an Online Startup Incubator Succeed?